The F & T Computer Scientist is a curious problem solver, comfortable with the “Big Ideas” of computer science, who is resilient and creative in breaking the mold. They are lifelong learners who use iterative processes to develop innovative solutions. In using iterative processes to develop innovative solutions, students develop the computational thinking necessary to become lifelong learners prepared for the unknown. Students learn fundamental concepts of computer programming, the iterative nature of engineering work, and the resilience required to persevere through failure. They will primarily use environments and tools designed to teach students high-level concepts in an age-appropriate setting, with opportunities to experience and explore professional-level tools within each unit during the middle school years. 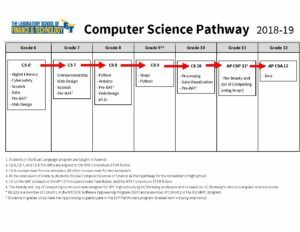 Upon entry to high school, students shift to primarily using professional tools, with occasional forays into coding environments designed for young learners. Students will draw deliberate connections across units and grades, linking concepts and languages to create more complicated and interesting products. Students will fully transition to using professional tools, learning to develop software that is production-worthy. Computer Science 9 Students in 9th grade begin high school Computer Science with a return to basics. Students briefly review programming concepts using the SNAP programming language (used later in AP CS Principles BJC) and learn the lab structure and independence required for success in higher level CS work. Students then transition to Python, exploring new techniques and features of the language, as well as the kind of writing and analysis they can expect to encounter in future courses. The primary goal for students in this course is to build stamina and independence in problems solving and creativity. Students are primarily evaluated on the basis of their work, which can take the form of reflections, writing assignments, and programs. Self-check quizzes are built into the Beauty and Joy of Computing lab pages, and end-of-unit assessments help to prepare students for the AP Create and Explore through-course assessments. Students are required to complete the AP Through-Course Assessment: Explore – Impact of Computing Innovations performance task and the AP Through-Course Assessment: Create – Applications from Ideas performance task. In addition to the through-course assessments, students will take the AP CS Principles Exam in May.